What’s the best time to send emails?- Email campaign. One of the most common questions we get at the time of sending an email campaign is “what’s the best time to send it?” Because of this, we conducted a study using data from more than 400,000 emails sent by Elliptic Marketing in 2014, taking into account open-rate and click-rate performance depending on the time and day of the week sent. According to our data, the best days to send emails are Mondays and Wednesday. Although these results are based on many variables, we can assume that most users “clean” their inboxes during the weekend, leaving it open for new emails received on Mondays. For Wednesdays, the cause may be similar; by this time of the week users are mostly done with early-week emails, giving more attention to Wednesday emails. 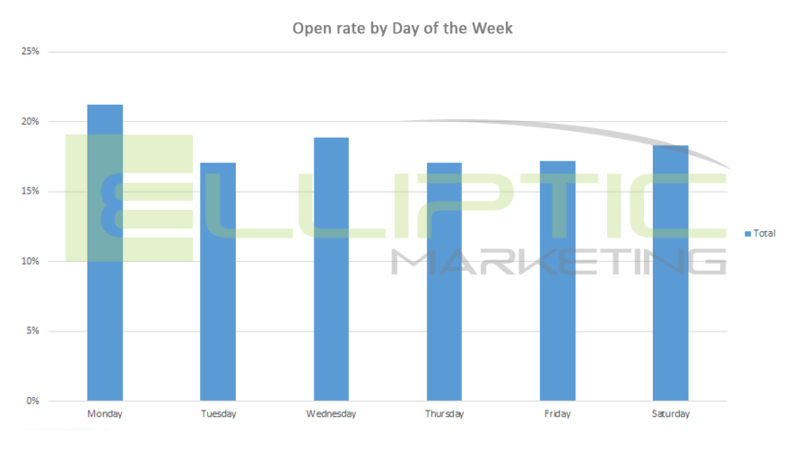 It is important to mention that these results contradict older trends that show higher open rates on emails sent only during midweek. The growing popularity of mobile devices has changed email opening behavior by making it more homogeneous. On previous years, higher open rates depended on the days on which users had access to their home or work computer. This is why most outdated studies advice against sending emails on weekends, when readers did not have access to work computers. Unlike day of the week, time is a much important factor affecting open rates. Our study found that the best times to send emails are 7:00AM, 3:00PM, and 9:00PM. These results show that most users are opening their emails during their day breaks; right after waking up, after having lunch, and before going to bed. Most of these openings occur on mobile devices. Actionable Emails (requiring purchases or getting user information): Send on later afternoon and late evenings when users have time to complete your desired action. B2B Emails: Send on Tuesdays and Wednesdays, either at 11:00AM or 3:00PM-4:00PM. The idea here is to avoid rush office hours. Not many users are going to pay attention to your email if you are sending it at 4:30PM on a Friday, when everybody is trying to clear their desk before the weekend. Leisure/Brick-and-mortar Shopping Emails: Experiment sending those during weekends. If you want to drive traffic to your point of sale, send emails early on Saturdays. For leisure services (hotels, spas, etc. ), send emails after 11:00AM on Sundays, when users have time to make reservations.